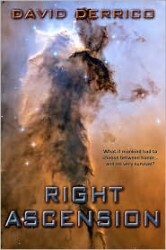 I’m pleased to announce that Right Ascension is now available at Barnes & Noble in paperback format (for those of you who haven’t hopped aboard the e-book train yet). It is currently on sale there for 10% off the cover price, and is just $8.79. Barnes & Noble also offers free shipping for its members, or if you spend over $25. The print version is a “trade paperback,” which is larger in size (mine is 6×9 inches), and higher in quality than the “mass market paperbacks” you usually find in the under-$10 price range. It also has higher quality, whiter paper than the gray pages you’d find in a mass market paperback. Now that Right Ascension is in the various databases it needs to be in, this also means that you can walk into your local Barnes & Noble or Borders or library (or wherever) and request that they order a copy for you. Hey, if enough people request it, they may even decide to stock a few extra copies in the store ….